In the summer of 1960, for the first and only time, the USA won a world team chess championship ahead of the USSR. This achievement is still on a short list of the most significant events in American chess history, especially as it happened on enemy ground during the Cold War. A team member describes the event and the lives of the players since then. 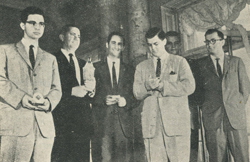 A day or two after we finished first in the World Student Team Championship at Leningrad 50 years ago, the seven members of the USA team stood on a stage facing hundreds of Soviet chess fans and players. We were the gold medalists but we tried to be relatively calm and serious during the award ceremony. However, we knew that this was the first time since the 1937 regular Olympiads that any American team had won a world chess championship. It also came at a time when the USSR dominated top-flight chess and had won every regular Olympiad since it first participated in 1952; after a 11-year hiatus following the start of World War Two, the only prior postwar Olympiad was held in Dubrovnik, Yugoslavia, in 1950 and won by the host country. The USSR had also won four of the five world student team championships in which it had participated (Bulgaria won the other, in 1959). The USA had entered a team in this annual event three times and never finished higher than fifth. I think that we maintained our composure well at the final ceremony until a Soviet band suddenly started playing “The Star Spangled Banner” after our victory was officially announced. This was somehow unexpected and made us more emotional than we would have been otherwise. I think a tear or two were shed and I know a shiver went up my spine and I felt a few goosebumps. The victory received much publicity back home because it occurred in Leningrad while the Cold War was still on. However, except over the chessboard, we had no real “war” with the Russians during our stay in their country; almost all the Russian chess fans and players, as well as people we encountered in places outside the tournament location, had been extremely kind and generous to us. We would return home with positive feelings about the beautiful city on the Neva River and its inhabitants. Back in New York, we received six telegrams from Mayor Robert Wagner, and a big celebratory dinner that nostalgic GM Reuben Fine (who had played on the victorious USA Olympic team in Stockholm in 1937) attended. The USA team consisted of William Lombardy, Charles Kalme, Raymond Weinstein, Anthony Saidy, Edmar Mednis, and myself, the first four assigned in order to boards 1-4 and the last two were first and second reserves with the opportunity to play if one or two of the first four were given a day of rest. USCF President Jerry Spann was the team captain, making decisions about the team lineup before each round. Lombardy and Kalme played in every one of the 13 matches, Weinstein in 10, Saidy and Mednis in seven, and yours truly in two. Kalme and Mednis were especially motivated to do well since both had been fortunate to be able to leave their native Latvia sometime during its takeover by the USSR in 1940, subsequent occupation by Germany during World War Two, or its reconquering by the USSR after the war when it reluctantly became part of the USSR. I believe that some of Kalme’s and Mednis’ relatives had been killed by either the Russians or Germans. There were 15 teams entered, which would normally allow each team only one bye. However, the pairing schedule became complicated because the preregistered Polish team never showed up and each team had another bye on the day they were scheduled to play Poland. Thus it was often difficult to calculate the exact standings because a team might have fewer byes left, and thus more matches still to play, than a close competitor. The 14 countries playing in this round-robin tourney were Belgium, Bulgaria, Czechoslovakia, England, Finland, German Democratic Republic (East Germany to us), Holland, Hungary, Mongolia, Romania, Sweden, USA, USSR, and Yugoslavia. During the first five rounds we scored 4-0 wins over Sweden, Romania, and Holland, a 3-1 victory over Czechoslovakia, and a 3½-½ triumph over England. We were ecstatic: 18½ out of a possible 20 points could hardly have been expected! We were 3½ points ahead of the USSR and 8 points ahead of Yugoslavia, which we figured would be our main competitors for first place. However, Yugoslavia had received a bye in the first round and had played only four matches. We faced the Yugoslav team in the sixth round and suffered a devastating defeat, 3½-½, with Kalme being handed his sole defeat in the tournament and only Lombardy gaining a draw. We had to reconsider our position in the tourney. At 19 points out of 24 we were still in first place with a ½-point lead over the USSR and that was a positive factor. Over the next five rounds we won all our matches by at least 3-1 scores and entered the twelfth round having a 33-32 lead over the USSR, with Yugoslavia third at 29 points. All three of us had received one bye by then, and the USSR had their second in the twelfth. We scored a 3½-½ win over Hungary while the USSR was idle. So the USA had amassed 36½ points while the USSR had 32 points as we started our crucial match with them in the thirteenth round. We had a bye left in the fourteenth round and only one more match to play after that. Our reasoning had to be that the USSR could score a 4-0 win in the fourteenth round and therefore we led them by only ½ point as our match with them began. You can imagine the tension. Lombardy had the black pieces against Boris Spassky, the only grandmaster in the tournament, Kalme was white against Alexander Nikitin, Weinstein black against Yury Nikolaevsky, and Saidy white against Janis Klovans. Surprisingly, Lombardy won the only relatively short game in the match, beating Spassky in 29 moves after the future world champion made a bad blunder, overlooking a fork of two of his major pieces by Lombardy's queen (see game on page 32). Kalme won a 75-move battle, Weinstein lost a 37-move game, but Saidy gave us the match victory, 2½-1½, by gaining the advantage but finally having to agree to a draw in 41 moves. This match result meant that, even if the USSR (with 33½ points) scored a 4-0 win in the fourteenth round while we were idle, we would enter the final, fifteenth round (with 39 points) at least 1½ points ahead of the USSR. But they could only beat Bulgaria by a 2½-1½ score in round 14. Thus the final round began with our having a 3-point lead over the USSR (39 versus 36), with Yugoslavia trailing in third place with 34½ points. We met the strong Bulgarian team in the last round, needing only 1½ points in the four games to win the world championship (the most the Russians could gain even with a 4-0 win over their opponent, Czechoslovakia, was 40 total points, whereas 1½ points would give us 40½ total points). “All the games were out of the opening with everything under control. In fact Ray Weinstein already had a won game according to the general opinion, and I had to agree. Kalme had a minimal advantage on the black side of a King's Indian Defense, and Mednis certainly had no problems on the defensive side of the same opening. As for myself, thinking to “take it easy” I sought simplicity but in spite of myself I gained a slight edge on the White side of an English Opening. Since the USSR beat Czechoslovakia in the last round by only 3½-½, the final standings showed the USA with a 41-11 total and the USSR in second place at 39½-12½. Yugoslavia finished a strong third with 37-15. The rest of the teams were at least 5½ points behind the first three. Our team members did very well in terms of how well their total scores ranked on each board number. Bill Lombardy had 11 wins and 2 draws to top all board one players (92.3%). Spassky finished in second place at 83.3%. On board two Kalme and Milan Vukčević of Yugoslavia shared top honors with 11½ out of 13 possible points (88.5%). Kalme’s only loss was to that Yugoslav player. It is interesting that Vukčević had a chance to beat out Kalme for the board prize because he also entered the last round with 11 points out of 12 games. Had he won his last game, he would have scored 12/13. But as soon as he heard that Kalme had accepted a draw against Bulgaria when the USA team agreed to four early draws to clinch the world championship, he felt it would be unfair for him to cop the board prize because Kalme took a quick draw under such conditions. Instead, in a gesture of true sportsmanship, he offered his German opponent a draw on the twelfth move, which was accepted. In 1963 Vukčević moved to the United States, changed his name slightly to Vukcevich, became a professor of metallurgy here and later a chief engineer at General Electric in Ohio, was nominated for the Nobel prize in chemistry, did well in several major U.S. tourneys, was named a grandmaster of chess compositions, and was elected to the U.S. Chess Hall of Fame. He died in Cleveland in 2003. Ray Weinstein played strong chess and shared the board three prize with Nikitin of the USSR, both scoring 7½ points out of 10 (75.0%). Saidy finished fourth among the board four players, with 4½ points out of 7 (64.3%) and Mednis ended up fifth among the first reserve players with the same record as Saidy (64.3%). I suppose I should say something about myself. I have always found it extremely disagreeable to drink carbonated beverages and I was foolish enough to drink from Leningrad water faucets, which seemed the only alternative to carbonated drinks. As a result, very early in the tourney I developed a parasitic infection that forced me, every 15 minutes or so, to rush to bathrooms quite far away from the tournament room. It's hard not to lose time on your clock if this kind of event occurs during actual games! As the USA’s second reserve player, I managed to obtain losing positions in the opening against both my Swedish and Mongolian opponents in the second and seventh rounds but fought back to win the former and lose the latter in 91 moves, after coming close to gaining a draw. Team Captain Jerry Spann and I agreed that it would be best for the team for me not to play at all during the second half of the tourney. I helped out by scouting prospective opponents, supplying as many bottles of soda water to our players as they required (Kalme in particular imbibed an incredible amount), and basically acting as assistant captain of the team. This was a useful experience for me since I was named captain of the USA team for the next event in Helsinki in 1961. It was fortunate that I was the weakest player on the Leningrad team; just imagine if Lombardy had drunk from water faucets there. I wasn’t cured of the infection until I returned to the USA and some new, experimental drug resulted in its disappearance. It is not easy to decide what to say about life in the Leningrad of 1960 when I cannot compare it to the situation in the St. Petersburg of today. The name of the city has reverted back to what it was before the Russian Revolution and I have not had the opportunity to visit it again over the half-century since we won the world championship there. After the event, Team Captain Jerry Spann assigned me the task of preparing a report for Chess Life on our victory - perhaps because I did not have much "work" to do during the tourney. However, rather than providing the kind of tournament summary you have just been reading I chose to leave that kind of report to others and to write about some of the people we met, how they felt about the USA and the world situation, the city itself, and how we were treated while we were chessplayer-tourists there. When I began to research this 50th anniversary article I realized that a complete summary had never been written about the tournament results and the round-by-round delights and disappointments the American team experienced. I have tried to fill that gap in the above passages and now have relatively little space to describe the human interest side of the picture. But some vivid memories of people, places, and personal interactions and conversations remain. We were in Leningrad a couple of years after Nikita Khrushchev had taken over as Premier of the Soviet Union. He had denounced Stalin's repressive measures and "crimes" and while we were in Leningrad there was what many referred to as a "thaw" in personal freedom and general attitude toward the USA, as well as an attempt to improve living standards, for example, in the fields of housing and availability of consumer goods. Jerry Spann later wrote that the members of the USA team "were treated wonderfully and the people cheered us." I recall that our reception committee at the airport could hardly have been friendlier - from Natasha, a brilliant and attractive engineering student who became very attached to our team and one player in particular (he and she might have developed a really strong relationship, but all of us were determined to take the tournament very seriously and no real romance eventuated, although I believe he corresponded with her after we returned home), to Raia, a Soviet woman candidate chessmaster who was to referee most of our matches in the tournament, to Volya, a medical student who knew more jazz talk and Dixieland tunes than any of us. All spoke English well and chatted nonstop as we drove from the airport to the Hotel Baltiskaya, on famed Nevsky Prospekt (Avenue). The Soviet team was also quartered at that hotel, not far from the Palace of the Pioneers where the tournament was held. Our assigned interpreter was a newly-wed, Svetlana, who was majoring in English literature at the University of Leningrad. However, she told us (as did many others) that the only "recent" American authors available to read in English were Jack London and Mark Twain. She was in charge of arranging for all our side-trips, shopping excursions, and meal tickets. In partial return we taught her to play chess, which we had thought all Russians already knew how to play! Svetlana never appeared to be keeping an eye on us, although we had suspected initially that she had some "spying" duties as well. We seemed completely free to come and go as we pleased and our team members often took unescorted walks around the city. A personal memory of mine was Svetlana's kindness in making an appointment for me to visit Pavlov's old lab in the city, where the director showed me some equipment from earlier days and inscribed a recent book of his own for me, which I still have among my books on psychology. We were impressed and even overwhelmed at times by the curiosity and warm feelings of most of our acquaintances, Many were surprisingly critical: "we know that most of what we read in the papers is just propaganda"; "we have at least as many spies as you do" - these are some comments I recorded from chance conversations. All of us on the USA team became involved in political discussions on one occasion or another, but the lack of hostility with which our beliefs were received was quite unexpected. Most of us had decided beforehand to avoid political topics and just play chess. Russian curiosity about the United States and its customs, salaries, and habits was insatiable: the price of automobiles, the availability of higher education, the merits of television (none of the TV sets in our hotel worked!). Absent from the streets of Leningrad were the large billboards and advertisements so characteristic of an American metropolis. The most provocative sign might be one advising passers-by to "Buy Soap" or "Use Taxis." The city of Leningrad was quite beautiful. The old Czarist palaces, statues, cathedrals and art galleries, the broad boulevards, the numerous bridges and canals, the intermingling of Greek, Roman, Byzantine, and eclectic architecture, all made the city as historic and interesting a city to visit as Paris or Rome. However, the new apartment buildings were drab and monotonous, seemingly built just for more living space, with little imagination involved in their planning. Many people told us how they never would have had the courage to approach Americans four or five years before. However, they often complained about the relative impossibility of their traveling abroad (without leaving a relative behind in Russia) and the lack of non-Communist books and periodicals in Russia. Most of us returned home with a list of American books that we posted back to various people: mysteries, dictionaries, and scientific and legal treatises. Comments critical of the Soviet regime were frequent among a good number of our Russian contacts, especially those from chessplaying groups or the better-educated citizens. The maids in our hotel, the elevator men, the taxi-drivers, while still treating us personally with great hospitality and warmth, echoed the theme that there are only a few people in the USA who have political power and that these tyrants were mainly interested in wars and money. The only English words some people knew were "Wall Street" and "Pentagon." We were bombarded with presents of Russian chess books, souvenirs, and even Sputnik pins. I happened to give a ball-point pen to one of the referees when she misplaced her pencil. On each of the next three days I was brought a different gift (chess score books, theoretical volumes by Keres that were hard to obtain in the USA, etc.). Fortunately, for many gift-givers I was able to retaliate with gifts of chewing gum (greatly prized by both adults and children) or with copies of Polaroid instant photos, a great novelty for all of them. Somewhere in my attic I still have such photos of Natasha, Raia, Volya, and Svetlana. Being a relatively old man, I am sorry that I will probably never return to the town that now bears the name of St. Petersburg and never discover how general conditions and the city itself have changed. I would like to search for some of the people we knew well, even though they will be relatively old men and women, too. The names of all seven members of our team may be unfamiliar to many of today's readers of Chess Life. However, those who knew or know us, as well as younger readers, will probably be interested in what has happened to each of us since we stood on that stage in Leningrad as world champions a half-century ago. Unfortunately, much of the news is not good. Some words about each of the seven conclude this article. A couple of months after our victory in Leningrad, William Lombardy announced unexpectedly that henceforth he would have little or no time for chess because he was entering a seminary and planned to become a Catholic priest and teacher. He eventually achieved this goal, but was allowed by his ecclesiastical supervisors to take time off to play on several U.S. Olympic teams in the 1960s and ‘70s. During that period he also managed to win or tie for first in three U.S. Open championships. Later he left the priesthood, reportedly because he felt that the administrators and accountants with whom he had to work were not really serious about the sacred mission of the church. He served as Bobby Fischer’s official second during his famous victory over Boris Spassky in Reykjavik, Iceland in 1972, which made Fischer the first American ever to win the world chess championship. Bill eventually married and had a son. Having played in only a couple of minor U.S. tournaments in the last 15-20 years, Grandmaster Lombardy is now retired from serious play, and supports himself by writing and lecturing about chess, and serving as an excellent, available chess teacher (go to www.williamlombardy.com, if you would like to become one of his students). Charles Kalme stopped playing tournament chess not long after 1960, obtaining a PhD in mathematics in 1967. He was associated with the University of California at Berkeley and the University of Southern California for a few years, but then an increasing interest in computer science and chess programs led him to spend the rest of his career working in the computer industry. He decided to retire early and to spend the rest of his life back in his native Latvia, attempting to arrange a national strategy there for bringing computer literacy to its secondary schools. Unfortunately, in 2002 he died a mysterious death in Latvia at the age of 62, which some reliable sources say may have been the result of a brutal mugging he suffered on the streets of Riga. The news is perhaps sadder about Raymond Weinstein. He did well in U.S. championships from 1960-1963 and was awarded the title of international master after qualifying for the World Interzonal tourney as a result of finishing third behind Fischer and Lombardy in the 1960-61 U.S. Championship event. He chose not play in the Interzonal tournament. Unfortunately, around 1963-64 Ray began to exhibit erratic, even dangerous behavior, was reportedly diagnosed as suffering from schizophrenia, and has been confined to mental institutions for more than 40 years. He is now 69 years old. Anthony Saidy has remained deeply involved with chess throughout his life, even though he worked professionally as an M.D. specializing in the treatment of tuberculosis patients. He won the Canadian Open in 1960, won or tied for first in two American Opens (the second as recently as 1992), has finished as high as second in the U.S. Open and fourth in the regular U.S. Championship, and gained the title of international master by tying for second in a grandmaster tourney at Venice in 1969. Besides the Leningrad event, he played on the U.S team in three other world student championships. And this year he played in a four-day, short tourney at the U.S. Open in Irvine, California at the age of 73. Author of two fine chess books (The Battle of Chess Ideas and a coffee-table book, The World of Chess, the latter in collaboration with Norman Lessing), Tony also possesses one of the largest privately-owned collection of chess books in America. Until a few years ago, in correspondence with me, he maintained he would still gain the grandmaster title before he was 95! He retired from his job as a Los Angeles County doctor in 2000, which has allowed him even more time for chess-connected activities. And Saidy’s home on Long Island will be remembered as the place where Bobby Fischer secluded himself during the furor before his world championship match with Spassky in 1972; Saidy was instrumental in finally convincing Bobby to travel to Iceland for the match. I met Edmar Mednis when, 13 years old, he walked into the Marshall Chess Club for the first time and challenged me to a game. Four years older but a fairly experienced tournament player, I was surprised at how talented and strong a player he was at that young age. He soon became one of the most promising youths in American chess and finished second to Boris Spassky in the 1955 World Junior Championship. He gained a degree in chemical engineering, worked a bit as a stockbroker, but could not resist devoting most of his time to chess. His playing career culminated in his earning the grandmaster title in 1980. Even so, his tournament results never gained him a place as one of the top five U.S. players. However, his victory over Bobby Fischer in the 1962 U.S. Championship, when Bobby overextended himself by continuing to play for a win in an equal position, was Bobby's first loss in a U.S. championship after years of going undefeated in America and winning every national championship he played in. This victory eventually inspired Mednis to write his first and most famous chess book, How to Beat Bobby Fischer in 1975. He wrote 25 more chess books after that, as well as hundreds of articles for Chess Life and other magazines, and was a sought-after chess teacher and trainer. I was shocked to hear that in February of 2002, while recovering from a minor, elective operation, he developed pneumonia, did not take it seriously enough, and suffered a fatal cardiac arrest. He was 64 years old. As for myself, I learned so much from being deeply involved in the Leningrad tourney that my own playing strength considerably improved. I won the Eastern Open in 1961, finished seventh in the U.S. Championship of 1961-62, captained the U.S. Olympic team in Bulgaria in 1962, and then managed to win the Washington, D.C. Championship three consecutive times from 1962-64. Since I had intended to stop playing serious chess on a positive note, so as to devote myself to professional, scientific interests and to having a family, this last outcome was the clincher! In 1965 I entered the academic world and never again played in a chess tournament. Thereafter I taught and did research on various topics in the fields of experimental psychology, neuroscience, and the history of psychology. Most of my career was spent at Indiana University, but I also held professorships at the University of Missouri, University of California at Berkeley, and Columbia University. Now I am semi-retired with a faculty appointment at the University of Arizona, where I mainly counsel undergraduates on careers in psychology and how to get into graduate school. I spent much time over the past 20 years or so combining my interests in chess and psychology by gathering information and thinking about the incredible accomplishments of players who excel in blindfold chess and how learning to play that form of chess can improve anyone’s regular chess. Last year, in collaboration with John Knott, we published a comprehensive book on the subject that is directed at chessplayers, psychologists, historians, and anyone interested in what the human mind can achieve. Saidy is the only one of the Leningrad Seven you still have a chance of seeing at the chessboard next to you in a long, grueling tournament. Three have passed away and another is committed to a mental institution. The other three of us still love the game of chess, even though we have devoted much of the last 50 years to other professions or activities. I am sure that memories of the 1960 world championship recur frequently for all three of us, and the victory is one of the major landmarks in our lives. Both Spassky and Lombardy were born in 1937. Spassky had held the grandmaster title for five years before this game. As a result of Lombardy’s performance in this tourney and other recent ones he was awarded the grandmaster title later in 1960. The two were good friends throughout their chess careers. Now if White had castled queenside, Lombardy wrote that he intended to do the same after playing ... b5, ... Bb7, and ... 0-0-0. To restrain Black’s plan of ... b5-b4. Spassky later stated that this move is “too modest” and that 10. Rae1 is stronger. If 11. Bh4 then Black has the strong answer 11. ... Nxe4. Although this move sets the trap 14. ... Nc4 15. Ndxb5, Spassky later called the move “debatable,” presumably because it allows Black to follow up with a move that will trade off his knight for White’s strong bishop and thereby obtain control of the black squares. 14. h3 was better. Some commentators recommended 17. e5 here but Lombardy stated that he would then have gained a decisive advantage after 17. ... dxe5 18. fxe5 Nd7 19. Rxf7 Rxf7 20. Bxe6 Qxe5! 21. Bxf7+ Kxf7 22. Qf3+ Nf6 23. Qxa8 Qxd4+. 17. ... e5 18. Nf5 Bxf5 19. exf5 d5! A fine move, threatening both 20. ... d4 and 20. ... Bc5. But it looks as if it just loses Black’s e-pawn. 20. Qxe5 Bd6! 21. Qe2 Bxa3 22. Nd1? This is the crucial stage of the game and both Lombardy and Spassky remarked that 22. Nd1 was the losing move. After 22. Nxd5 Lombardy planned ... Qc5+ 23. Kh1 Bxb2 with a “glaring but not immediately decisive edge for Black.” But Spassky wrote that he judged this position equal. 22. ... Rae8 23. Qf3 Bc5+ 24. Kh1 Rxe1 25. Rxe1 Qa5! Spassky had overlooked this simple fork, attacking both White’s bishop and rook. Not 26. ... d4 because White could play 27. Ra1! saving the piece because of the threat of 28. Bxf7+. 27. Nxd5 Qxa2 28. Nxf6+ gxf6 29. Qc6 Qc4, White resigned. Now if 30. Qxf6 Qxf4 31. Rd1 Re8 and ... Bd6 cannot be prevented. So Spassky resigned. An unusually feeble game by Boris but a very good one by Bill. Boris was pilloried in the Soviet chess and regular media and not allowed to leave the USSR for some time. But a year later he won the Soviet Championship in 1961, one of his two victories in that elite event (the other was in 1973, the year after he had lost his world championship title to Bobby Fischer and was pilloried even more). He seemed to be very good at making comebacks after serious losses. The tournament was held in the Palace of Pioneers on Nevsky Prospekt (Avenue), Leningrad's major thoroughfare. Saidy describes this win, from a totally hopeless position, as a “miracle” while others might call it just a swindle. To save space no comments are supplied until the critical, diagrammed position was reached. White has been thoroughly outplayed by the 16-year-old Gheorghiu and he might have resigned after 36. ... cxd6 were it not for the fact that both players were in extreme time pressure to reach the 40th move. Gheorghiu apparently knocked White’s pawn on g3 off the board in his haste to move quickly. Saidy calmly replaced it. Some reports state that Gheorghiu called “check” when making this move, thinking the pawn on g3 was still missing. Amazing! Now Black is lost. He cannot prevent White’s pawn from queening and leaving White a bishop ahead with a won game. The players had made a few extra moves because they were not sure the time control had been passed. After 43. ... Kg8 44. Qg5+ followed by Qd2 or Qc1 stops a possible perpetual check by Black so Gheorghiu resigned. Since we eventually finished only 1½ points ahead of the USSR team the battle in the remaining 12 rounds would have been even closer. As we will see, Charley Kalme traces the concept of playing his king's bishop one step at a time, from f1-g2-h3-g4, to a strategy he noticed in the checkers section of a Soviet chess magazine. There are not many occasions when a strategy in checkers may help in playing chess. Many of my annotations are partially based on Kalme’s notes published in the American Chess Bulletin. A wasted move since Black plays ... b5 three moves later. An interesting and important idea. Kalme was concerned that Black might try to play 11. Nf1 f6 12. exf6 Nxf6 13. Bh3 e5!? 14. Bxc8 Qxc8 15. Nxe5 Bd6 with good play for the sacrificed pawn. Since White wants to over-protect e5, his move prevents this possibility. Kalme stated that he first thought of the idea of Bh3-Bg4 when reading the checkers section of Shakhmaty! He intends to continue soon with Bf4 and then play h2-h4 to “cement” the bishop on f4; so the bishop must get out of the way to permit h2-h4. Note that because of Black’s subsequent play it was never necessary to play h2-h4. Defending the knight on d7 and preventing White’s Nxd5. 20. Rac1 Rc8 21. Rc2 Rac7? Better was 21. ... Ncb8, after which Kalme thought White has only a minimal advantage. Now White crashes through with a fairly obvious sacrifice that allows his two bishops to come to life. 23. ... Nf6 was a better defense. After 24. ... Rxc7 the simplest way for White to win is probably 25. Bxe6+ followed by 26. Qf4. An alternative way to win was 26. Rexc6 Nxc6 27. Bxc8 Q(or B)xc8 28. Qc1 Bb7 29. Ne5. There was really no defense to the threats of Ne5 and Ng5. If 26. ... Qd8 then 27. Rexc6 Rxc6 28. Rxc6 Nxc6 29. Qe6+ Kf8 30. Qxc6 Be2 31. Ne5 Bxg4 32. Nxg4 with a winning position for White. 27. Rexc6 Qa7 28. Rc7, Black resigned. Due to space considerations, part of this article will be online beginning November 1 on Chess Life Online at uschess.org.